When the Senate returns from the July Fourth recess, lawmakers will have just about two weeks to fix a shortfall in funds for federally-backed highway projects, with both parties again in a dispute over taxes. If past is prologue, that means campaign-style events with bulldozers and hard hats will be coming to a city near you, and there still might not be a good solution. The chairman of the Senate Finance Committee has floated plan to keep highway projects from grinding to a halt — but that solution has already drawn the ire of Republicans. Updated 2:37 p.m. | Sens. Christopher S. Murphy, D-Conn., and Bob Corker, R-Tenn., are proposing a 12-cent increase in the gas tax to pay for a renewal of highway and transit programs, which could run out of funding by the end of the month . "Reaction on the Democratic side has been positive," said Murphy, who noted he spoke with Senate Majority Leader Harry Reid, D-Nev., and Senate Finance Chairman Ron Wyden, D-Ore., about the plan. It&apos;s time to ban electronic cigarettes on airplanes, seven Democratic senators said in a new letter to the Transportation Department chastising the Obama administration for failing to act. The signatories on a letter to Secretary of Transportation Anthony Foxx point to a proposed rule banning electronic cigarettes that&apos;s been pending since 2011. The Senate&apos;s leading voices against in-flight cellphone calls are at it again. Sens. Lamar Alexander, R-Tenn., and Dianne Feinstein, D-Calif., have sent a letter to Transportation Secretary Anthony Foxx calling for a prohibition on voice calls. 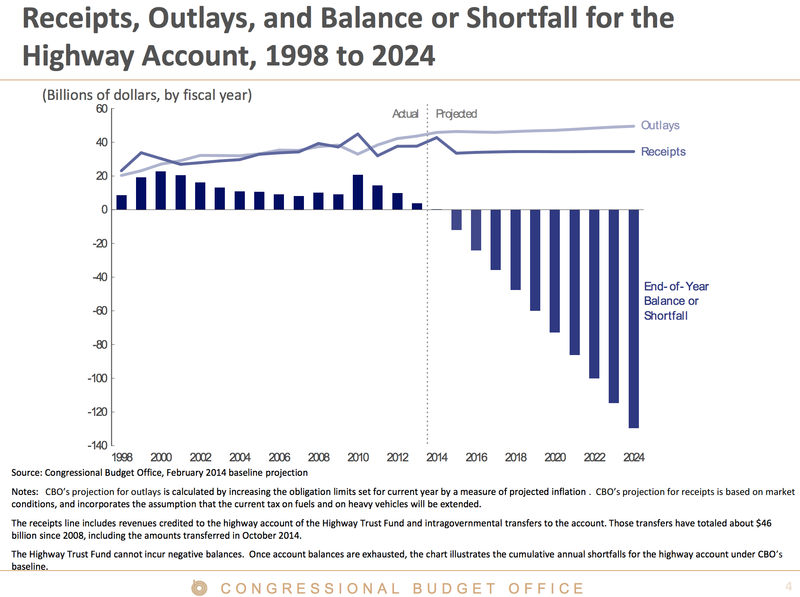 The chart shows the yawning gap between projected revenue for highways and projected spending. That gap is set to grow thanks in large part to two factors: the fact that the gas tax wasn&apos;t indexed to inflation and thus is stuck at 1993 levels, and improving fuel efficiency, which reduces gas tax revenue even further. The CBO says if the gas tax had been indexed for inflation in 1993, it would have gone from 18.4 cents a gallon then to 29 cents a gallon today.